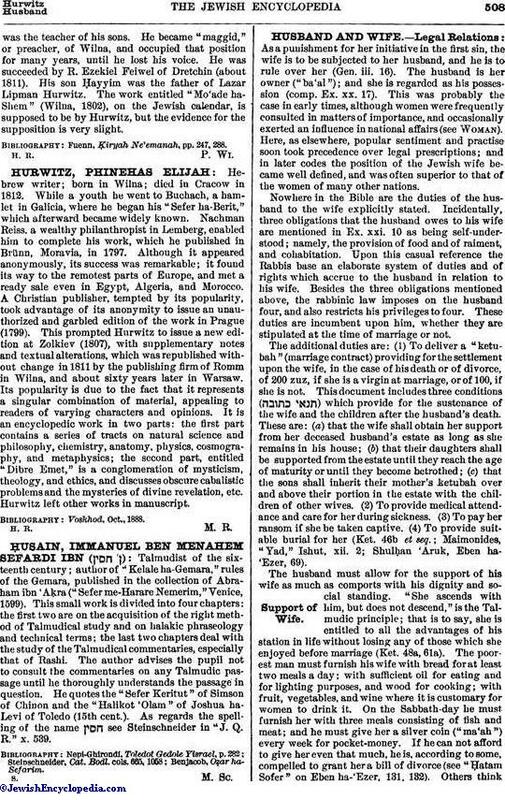 Hebrew writer; born in Wilna; died in Cracow in 1812. While a youth he went to Buchach, a hamlet in Galicia, where he began his "Sefer ha-Berit," which afterward became widely known. Nachman Reiss, a wealthy philanthropist in Lemberg, enabled him to complete his work, which he published in Brünn, Moravia, in 1797. Although it appeared anonymously, its success was remarkable; it found its way to the remotest parts of Europe, and met a ready sale even in Egypt, Algeria, and Morocco. A Christian publisher, tempted by its popularity, took advantage of its anonymity to issue an unauthorized and garbled edition of the work in Prague (1799). This prompted Hurwitz to issue a new edition at Zolkiev (1807), with supplementary notes and textual alterations, which was republished without change in 1811 by the publishing firm of Romm in Wilna, and about sixty years later in Warsaw. Its popularity is due to the fact that it represents a singular combination of material, appealing to readers of varying characters and opinions. It is an encyclopedic work in two parts: the first part contains a series of tracts on natural science and philosophy, chemistry, anatomy, physics, cosmography, and metaphysics; the second part, entitled "Dibre Emet," is a conglomeration of mysticism, theology, and ethics, and discusses obscure cabalistic problems and the mysteries of divine revelation, etc. Hurwitz left other works in manuscript.